Blomberg knows an upscale urban lifestyle often puts space at a premium, but that doesn’t mean sacrificing style or superior performance. Our 24-inch compact washers and dryers fit in perfectly, offering flexibility and freedom in installation (including an optional stacking kit), plus all the functionality and finesse required for expert clothing care. Despite their compact size, these washers deftly handle 2.5 cu. ft. of laundry while the dryers dry 4.1 cu. ft. loads—both with a variety of cycles for different fabrics. Commitment to living consciously should extend to clothing care, so Blomberg brings intelligent energy and water conservation to the laundry room. All our washers are ENERGY STAR® certified and offer automatic water adjustment for each load. The same is true for all our dryers, including Blomberg’s best-in-class Heat Pump Dryer which made the 2018 ENERGY STAR® Most Efficient list for using 50% less energy than conventional dryers. Thoughtful design and engineering is what earned Blomberg the ENERGY STAR® 2017 Partner of the Year Award. 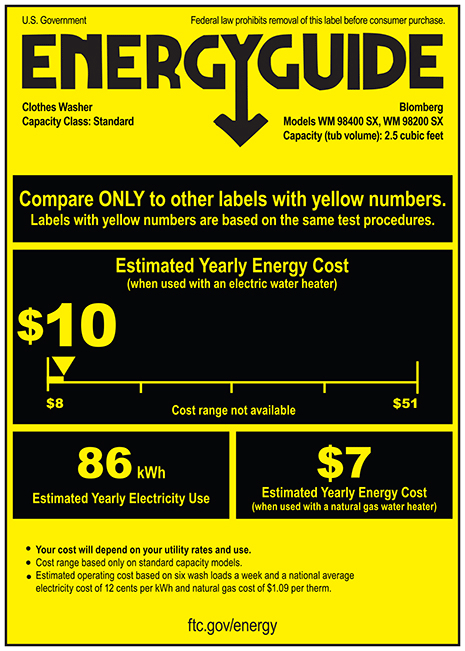 All Blomberg washers are ENERGY STAR® certified for conserving energy and water. Each machine features an automatic water adjustment system that calculates the volume of laundry, so every load uses only the amount of water required to spotlessly clean and thoroughly rinse—not a drop more—and you can wash a small load as economically as a large one. 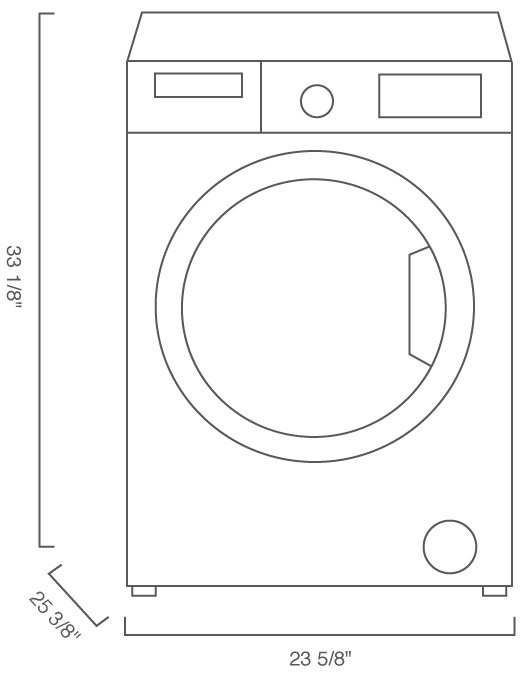 Despite their compact size, Blomberg washers can wash 2.5 cu.ft. of laundry per load, thanks to a roomy and deep drum design that easily handles heavy loads and even bulky items such as comforters. 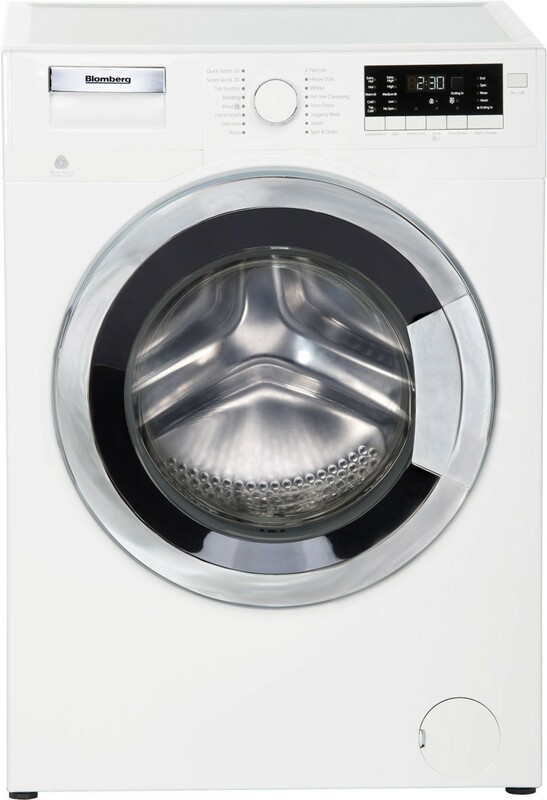 Designed to be in perfect harmony with your life, Blomberg washers offer up to 16 special washing programs that automatically adjust to specific laundry situations or different textiles from delicate lingerie to heavy-duty work clothes. The result is consistently clean, fresh, well cared for clothing and linens with little effort and no guesswork on your part. When time is of the essence, Blomberg offers a super-fast cleaning cycle for small loads of lightly soiled or unstained clothes or items you’ve only worn once. Exercise this option for frequently washing and refreshing your daily workout clothes. It’s ideal for small loads and works equally well on sportswear made from cotton, synthetics, or blends. For large families with lots of bed linens to change and towels to wash, Blomberg’s 24-pound capacity washers perform beautifully and efficiently. Just set the special program and wash up to five sets of double sheets or 14 plush towels in a single load. Specially designed to gently but thoroughly launder thicker fabrics, this special program automatically adjusts to a higher water level and adds an extra rinse cycle. Garments come out spotless with no remaining traces of detergent. Blomberg understands no two families are exactly alike and no two loads of laundry are either. So our engineers created customizing options and auxiliary functions that help harmonize traditional wash cycles with your unique needs and provide better clothing care. Blomberg’s washing machines are state-of-the-art and fully in tune with the way laundry gets done now. The easy-to-use liquid detergent compartment is right in step with delivering the best washing conditions for today’s different kinds of fabrics. * Required when operating a Blomberg washer and dryer on the same circuit. The washer plugs into the rear of the dryer. This is why a 208 – 240V / 30 Amp circuit breaker is required. Machines should not be directly connected to any other brand washer or dryer. Product description is general and the parameters of an entire category. Blomberg guarantees compliance with the product image in the time of advertising material. This product can expose you to chemicals including Nickel (Metallic) which is known to the State of California to cause cancer. 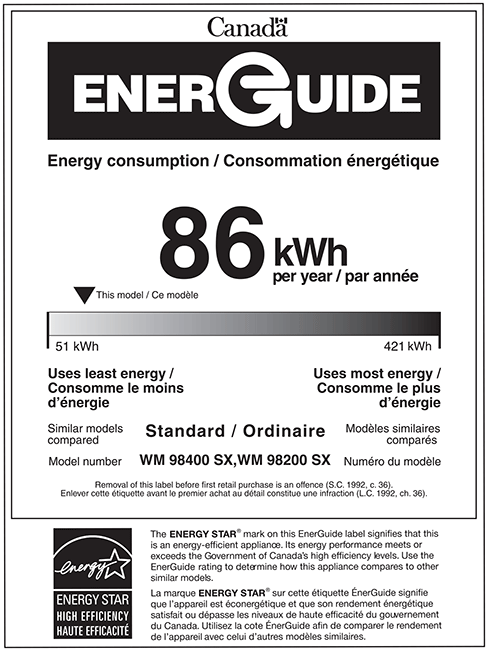 For more information, to go: www.P65Warnings.ca.gov. Note: Nickel is a component in all stainless steel and some other metal components. 24" Front Load Washer is rated 2.5 out of 5 by 2. Rated 4 out of 5 by Tanguera from Small footprint; very good performance Bought the washer/dryer for a new rental unit. An initial test run produced clean laundry with little water use. I hope the products will stand the test of time. A request for product support remains unanswered. Fortunately, I solved the problem on my now. Rated 1 out of 5 by James88 from Good Product - No Parts Poor Warranty Bought this washing machine as a floor model, can’t get parts needed for repairs & warranty is none existent.